I am wild for wind turbines. I can't get enough of the white height and grace of them, and the moving space between the blades seems as visible as those big wings themselves. The first wind farms I ever saw were around Palm Springs, and the turbines actually looked cool in the sere, hot desert. On and on they went, spreading over dry hills for miles, and my fascination was cemented. Thinking of wind turbines as Western creatures, I was surprised and delighted by the array along the Pennsylvania Turnpike. Issues surrounding objections to the Nantucket Sound Cape Wind project are foggy to me, enamored as I am. The easy answer is that I would rather have a wind turbine than a yacht. But then again, I live in an old school that has five restrooms and no closets. What would I know? 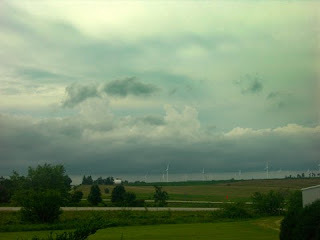 I do know that I lost my heart to Iowa's wind farms when we recently drove to Denver and back. On one particular dim, damp, hot morning --- with the sky preparing for some extravagant storms --- we just gazed at the wind workers in the field down the road, and wondered how much it would cost to get one. Or two. I wanted to tell you I love the graceful, sculptural shape of these wind turbines. On the west side of Salina, KS ( my childhood home ) there is now 16 miles of them. Stunning! Can you get close enough to hear them? What is it like?